PLOT SUMMARY: Warcross is a virtual reality game that, over the past decade, has become the most popular form of entertainment in the world. Some people play it competitively, or to make money, while others simply want to escape from real life. Emika is a hacker and bounty hunter who's about to be evicted from her apartment. Desperate and willing to try anything, Em decides to try and hack Warcross' airtight security system during the opening ceremonies of the yearly championships. Instead, she manages to hack herself into the game, on international TV. Em is sure she's going to be arrested, but instead, she gets the shock of her life when the creator of Warcross, Hideo Tanaka, instead offers her a job. Acting as a spy for Hideo, Emika is tasked with figuring out who's been trying to hack Warcross' system for the past few months, and what, exactly, it is that they want. FIRST THOUGHTS: AAAAAAAAAAAAAAAAAAAAAAAAAAAAH. I just finished reading this book and my mind is REELING. I haven't read any really good sci-fi for a while, so this was a breath of fresh air... until it punched me in the gut. (In the best way possible.) This book is the first in a series and, honestly, thank God, because that ending made me feel so many things. I need to read more about this world and these characters! I've never read anything by Marie Lu before, but now, I see what all the hype around her is about. If you're looking for a new, exciting sci-fi story that makes great use of the technology the characters have access to, read Warcross. You won't regret it. THOUGHTS ON PLOT: Okay, so the ending of this book personally came into my home, punched me in the face, lit me on fire, and left. At least, that's how it felt. Right from the first page, I was sucked into the world and the story of Warcross, and that ending has me craving the next book. (Which doesn't have a release date yet... or even a title... AAAAAAAAAGH.) If you like the anime Sword Art Online, you'll probably like Warcross. The element of competition and the espionage plot with Emika being Hideo's spy kept the stakes almost unbearably high for this one, and I honestly didn't see the ending coming. Like, at all. Go into it blind; trust me on that. THOUGHTS ON CHARACTERS: Emika is a great heroine for this new series. I've seen her compared to Katniss Everdeen from The Hunger Games, and that comparison is an apt one, but Em is definitely her own person. She has an edge to her, but she's incredibly noble and her struggles are so relatable that it's near-impossible not to root for her. I had a feeling from the summary that I'd like Hideo, and for the most part, I was right. But what really surprised me was this book's villain. I can't give too much away right now, but I genuinely love them, in that horrified, exhilarating way you love a really great bad guy. I can't wait to see them in action in the next book, now that the groundwork for their plan has been laid. 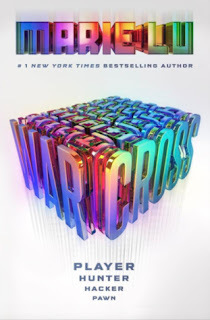 THOUGHTS ON WRITING STYLE: This novel has some really great worldbuilding, which is good because the way Warcross works is a bit confusing at first, at least for me. (Then again, I do have an unparalleled talent for missing the painfully obvious, so you'll probably be fine.) While there are some spots that feel a bit infodumpy, these are few and far between. I really loved Emika's voice as she takes us through the story, and introduces us to this world that is so unlike our own, but could be our own in the not-so-distant future. And my... er... emotional reaction to the ending, as detailed above, is a testament to how good Marie Lu is at metaphorically sucker-punching her audience. THOUGHTS ON POLITICAL STUFF: There's been a cry for more diversity in fiction, especially in fantasy and sci-fi. Where contemporary YA has steadily been getting more inclusive, a lot of the more outlandish stories have remained straight and white. Warcross is a very welcome exception. There are two Asian leads, multiple POC side characters, and some characters who are implied to be queer. (Hopefully this'll be expanded on in the sequels.) There's also a character that's in a wheelchair, and I thought it was interesting how he's able to perform incredible physical feats in Warcross that would be impossible in real life. I also thought that the debate the book presents about technology is interesting, though I can't really comment on it without totally spoiling it. I'm curious to see how the sequels will handle it. FINAL THOUGHTS: This is gonna be a series that takes over my life for awhile, I can tell. I could totally see this as a TV show, or a blockbuster movie -- it's action-packed, full of amazing descriptions that would make really cool visuals, and it has a very timely message about technology and the anonymity of the internet. And holy crap... that ending. I can't wait for the sequel. I've heard rumors it's due out in 2019, but I'm not holding my breath until the author or publisher officially announces it. Here's hoping we get word soon! If you've read Title, I'd love to hear your thoughts in the comments below!